A few months ago, when I was in the throes of a semester that could best be described as hectic – and would better be described as hellish -- I made a promise to myself: If I could just manage to hang on for a few months more, I’d reward myself by doing . . . absolutely nothing. I’d spend my days lounging and loafing and lifting my fingers only long enough to pop bonbons into my mouth. I’d read books and take naps and daydream and go to the movies in the middle of the day. I’d spend hours with the New York Times and learn exactly what went wrong in Darfur and Iran and North Korea. (Iraq? Not a chance.) I’d reacquaint myself with members of the royal family and take the imperial pooch for bracing walks. I’d forget about the anxiety that had filled my days and would strive to incorporate tranquility into my daily existence. So here it is, a month into this declared hiatus from stress. And guess what? Well, I have eaten a few bonbons. Actually, these tasty little tartlets probably don’t technically qualify as bonbons, but they’re the closest things I’ve got. (I’m going to conveniently forget the box of hand-picked See’s Candies, the bittersweet chocolate squares from Dean & DeLuca, the French toffees, and the assorted dark and milk chocolate Wilbur Buds that have been hanging around the house since the holidays.) I think, however, the tartlets’ petite size and saucy shape merit a mention and in fact suggest that they are precisely the type of delicacy that Marie Antoinette (great movie, huh?) would have nibbled on during her moments of idle self-indulgence. 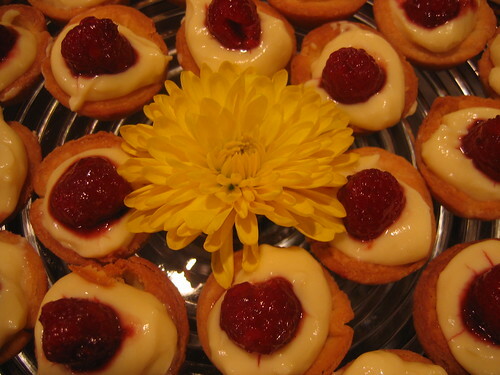 I served the tartlets to my book club on Tuesday night when the eight of us met here to gossip have a scholarly discussion about Anita Rau Badami’s novel, The Hero’s Walk. 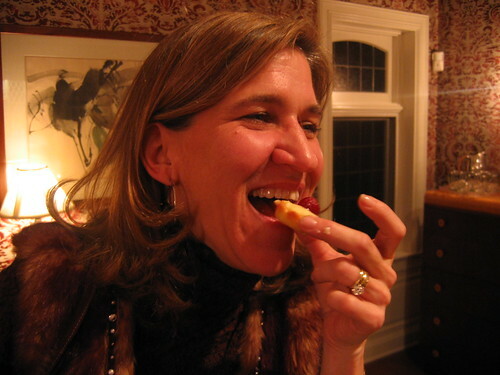 I thought something with fruit and a vanilla pastry cream might temper the spicy curry and chutney flavored hors d’oeuvres. (Indian themed food for an Indian novel) Since a whole tart of pastry cream might ooze unappetizingly when sliced, I feared that my bookish companions might take a rain check on dessert. (I confess that I’ve heard tell of that phenomenon, although have never actually experienced it myself.) 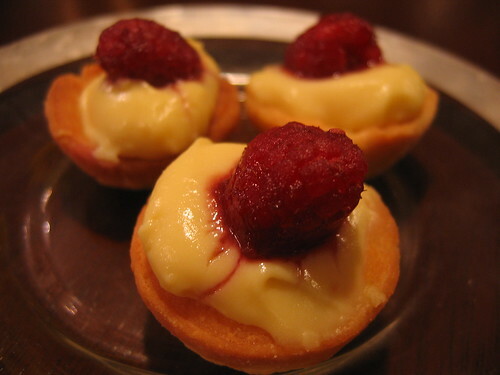 Ergo, tartlets. If you remember from an earlier post, I had a few problems with shrinkage when I last baked tart shells. So this time, I tried a different crust recipe and used mini-muffin tins exclusively, cutting the dough into rounds with an inverted champagne flute. The result? They still shrunk. Overall, this meeting of the book club was a success, despite the occasional distractions from the zebra finches’ cacophonous ruckus and Lucy the Labrador’s vigorous snores. I’m simply thankful my guests weren’t aware of the menagerie's other creatures -- the five flying squirrels that had been lurking upstairs just last week. This vanilla pastry cream is so divine that you might find yourself creeping to the refrigerator, spoon in hand, just to check in on it. Combine flour, powdered sugar, and salt in food processor. Add butter and process until mixture is crumbly. Pulse, adding water and egg yolks, until mixture holds together. Divide dough in half, form into two flattened disks, wrap in plastic, and refrigerate at least an hour. Preheat oven to 400. Roll dough into 1/4 inch thickness. Depending on size of tins, use round cookie-cutter, or biscuit cutter, or inverted glass to cut rounds of dough to fit tins. Fit dough into tins and bake 15-20 minutes (or until golden brown). Transfer to rack and cool. Heat milk and 1/4 c. sugar in saucepan over medium heat. Combine egg yolks and 1/4 c. sugar in a bowl and whisk until pale colored. Stir in flour and salt. When the milk begins to boil, remove from heat. Slowly dribble hot milk into yolk mixture, whisking continuously. When half of milk has been added, place all of the yolk mixture into the saucepan over medium heat. Mix the pastry cream, making sure to stir thoroughly. Bring mixture to a boil. Let boil for 1 minute, stirring constantly. Mixture should be thick. Remove from heat and add the butter and vanilla, stirring. Place into a bowl and cover directly with plastic wrap to stop a skin from forming. Chill. Melt jam over low heat. Add berries and toss gently to combine. 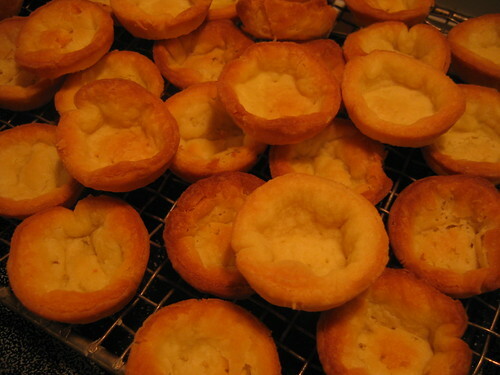 Spoon or pipe pastry cream into tartlet shells. Position berries atop. You mean there were Thing 3, Thing 4, and Thing 5??? Hoo, boy. You do need a breather. Is there any good functional substitude for mini-muffin tins if one does not own such a thing? see, my point exactly, where oh where are these Things coming in from??? These are great. I also like using phyllo every once in a while to change up my tarts. And, like your recipe, the phyllo can be filled with sweet or savory. Can't wait to try yours! Thanks! Anonymous, Alas, we're now up to Thing 6. You could use regular muffin tins, I suppose, with correspondingly larger tartlets as a result. You don't have anything against wee food, do you? Anonymous, I think they must have come down the chimney with Santa. Pebbles, Phyllo's a great choice. Just today at the market I saw phyllo shells and a whole new line of other pastry cups in the freezer. 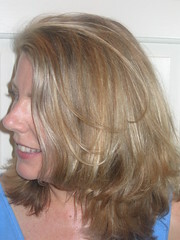 An end to the shrinkage woes, perhaps?